On March 28, 2019, Homeland Security Secretary Kirstjen Nielsen sent a letter to Congress with an "urgent request" for assistance in stemming what she described as a tide of migrants overwhelming the border, and stating that the department is facing a "system-wide meltdown". According to that letter, there are 1,200 unaccompanied alien children (UACs) in U.S. Customs and Border Protection (CBP) custody, in addition to 6,600 families, bringing the total of children in CBP custody to "approximately 4,700". While she admits that the detention of those UACs is "an unacceptable length of stay in facilities not designed to hold children for extended periods," there is nowhere else for them to go: The systems within the Department of Health and Human Services (HHS) to care for those children in residential shelters are reaching "peak capacity". 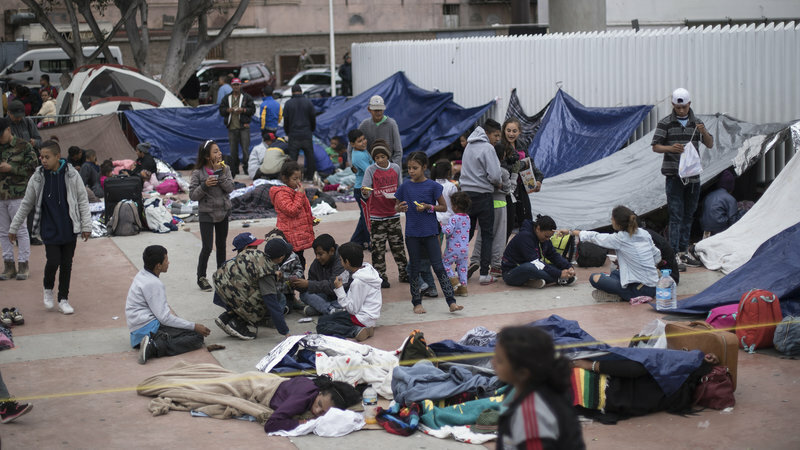 The border and immigration facilities at the Department of Homeland Security (DHS) "are at (or over) capacity with serious over-crowding" as thousands of migrants rush toward the United States. Although U.S. Immigration and Customs Enforcement (ICE) "has been urgently working to acquire additional bed space and to speed up transfers of individuals into their custody", the department has had to release both adults as well as families directly from CBP custody. Such releases will simply encourage greater numbers of foreign nationals to speed toward the United States, taking the chance that they will be among those who get released. Why is this a problem? As the secretary explains, "children ... are put at high risk by this emergency and ... are arriving sicker than ever before after traveling on the treacherous trek." Lest you think that the secretary is overstating the dangers, she actually quantifies them: DHS "agents and officers are performing more than 60 hospital visits a day — many to ensure young people get immediate treatment — and we now are regularly seeing individuals arrive with life-threatening conditions." Reports of violence and sexual assault along the route are now pervasive, meaning that many arriving migrants require especially focused care. In some cases, girls as young as 10 years old in DHS custody require pregnancy tests so we can be sure they get essential medical support. And with increased flows, smugglers and traffickers are forcing more people into inhumane conditions along the journey and putting lives in danger. They are preying on innocent people for profit and exploiting this crisis to line their pockets by breaking our laws. Today on the Southwest Border we are facing an escalating refugee crisis. Parents are handing over their young children by the thousands to cartels who are profiting by smuggling these kids to the United States. Many are under the age of 10, including some barely old enough to walk. These children with no parents, relatives, or legal guardians risk a perilous and sometimes fatal journey, riding buses or trains from Central America via Mexico. As a father of five, it is unimaginable to me what would compel a parent to risk the lives of their children on such a dangerous passage. Not to mention the risk of sexual assault, exploitations, and the potential to be trafficked. When they arrive at the border, the children are simply turning themselves in to the nearest Border Patrol Agents. However, patrol stations are not set up to handle this massive and growing number of detainees, let alone children. To be clear, we face an urgent situation in the Rio Grande Valley. Last fiscal year, CBP apprehended more than 24,000 unaccompanied children at the border. By mid-June of this year, that number has doubled to more than 52,000. Those from Guatemala ... El Salvador, [and] Honduras make up three-quarters of that migration. On Friday, I traveled to South Texas for the fourth time in 6 months in office, this time, to lead an interagency team to oversee our efforts there. While there, we met with officials at McAllen and Lackland to review the situation and hear directly from those on the ground what their needs are. While there, I spent time talking with the children again. It is a vivid reminder that this is a humanitarian issue as much as it is a matter of border security. We are talking about large numbers of children without their parents, who have arrived at our border hungry, thirsty, exhausted, scared, and vulnerable. How we treat the children in particular is a reflection of our laws and our values. Therefore, to address this situation, our strategy is three-fold. First, process the increased tide of unaccompanied children through the system as quickly as possible; No. 2, stem the increased tide of illegal migration into the Rio Grande Valley; and No. 3, do these things in a manner consistent with our laws and values as Americans. There is little or no chance at the present time that the Democrats who control the House of Representatives will either close loopholes that are encouraging UACs and families to enter the United States illegally, or provide additional funding for detention, despite statements made during a March 31, 2019, visit to El Paso by House Judiciary Chairman Jerrold Nadler. What we saw was a detention facility that was grossly, grossly overcrowded with people. We saw people lying in a room, one room with women, one with men. No place to sit down, no chairs, no beds, nothing. ... It's apparent to me that the personnel there are doing the best they can but it is grossly overcrowded. In spite of the statements in El Paso, Chairman Nadler did not mention the humanitarian issues at the border on his Twitter feed, which focused on the census and gaining access to the Mueller report. Perhaps, when the humanitarian situation at the border gets dire enough, or an individual who poses a risk to national security is able to use the current disaster at the border to enter this country and directly harm Americans, Democrats in Congress will be willing to at least consider addressing the vulnerabilities within our current law that are being exploited. Short of that, however, I do not believe that they would want to give the president any "concessions" to address the current situation along the Southwest border. This plan calls for DHS to stand up tent facilities adjacent to the existing detention centers used along the border and house illegal migrants there — even the families — in lieu of the dizzying catch-and-release process that is now the norm. If these migrants were coming by sea, there is no question that a mass-migration plan would have been implemented already, with bipartisan support. That is because of the well-understood dangers of a sea passage. Secretary Nielsen's letter makes clear that the land transit of Central Americans to the United States that is currently overwhelming our immigration system poses equal, albeit different, dangers to the migrants themselves. Accordingly, I have directed the Secretary of Homeland Security (Secretary) to establish an interagency Unified Coordination Group to ensure unity of effort across the executive branch in responding to the humanitarian aspects of this situation, consistent with the Homeland Security Act of 2002 and Homeland Security Presidential Directive-5 (Management of Domestic Incidents)(HSPD-5), including coordination with State, local, and other nonfederal entities. As the Federal Coordinating Official, the Administrator ... shall lead and coordinate Federal response efforts to ensure that Federal agency authorities and the resources granted to the departments and agencies under Federal law (including personnel, equipment, supplies, facilities, and managerial, technical, and advisory services) are unified in providing humanitarian relief to the affected children, including housing, care, medical treatment, and transportation. The Administrator shall execute these responsibilities consistent with all applicable laws and regulations, including legal requirements governing the appropriate care and custody of UAC. Secretary Nielsen's letter makes clear that such an effort is needed now, even more than it was in 2014. President Trump should follow President Obama's example and set up a similar unified coordination group to address the disaster that is unfolding along the Southwest border involving now not only UACs, but also family units. The situation has gotten too large for DHS to handle alone; a unified federal-government response is needed. That effort would support implementation of the land mass-migration plan. DHS is well positioned to play its part in such a response: current Acting ICE Director Ron Vitello was the official put in charge of coordinating the 2014 effort within DHS. The president should also act on this threat, in whole or in part, as soon as possible. When DEA agent Enrique "Kiki" Camarena was murdered in Mexico. In the immediate aftermath of 9/11, inbound international flights were temporarily diverted to other nations and not permitted to land — they were, in fact, escorted away by U.S. military aircraft scrambled as the government reacted to the attacks — and although the border was not per se closed, virtually all individuals arriving at ports of entry found their documents, and their possessions, baggage, and vehicles, subject to intense scrutiny and themselves often subjected to lengthy and detailed secondary inspections. The legal justification for these actions can be found at Section 215 of the INA. It is an interesting section of law in that it applies to both aliens and citizens of the United States. The language of the statute is deliberately broad, and provides to the president in immigration and international travel control matters the same kind of plenary powers that he enjoys as commander-in-chief and as chief executor of the foreign policy of the United States. It was clearly enacted into law with an understanding that in his unique position as leader of the country, there will be times when his authorities must be nearly unfettered in order to safeguard the nation and its citizenry. Mexico will help to regulate the flow of Central American migrants passing through its territory, but the root causes behind the phenomenon must be tackled, Mexican President Andres Manuel Lopez Obrador said on Monday. Speaking after his U.S. counterpart Donald Trump on Friday threatened to close the U.S. southern border if Mexico did not halt illegal immigration immediately, Lopez Obrador said he would not have a confrontation with the United States. "I prefer love and peace," Lopez Obrador said, speaking at his regular morning news conference. It is not clear whether by "root causes", President Lopez Obrador was referring to simply the economic situation in Central America, or whether he included the deficiencies in U.S. law. If President Lopez Obrador fails to act on this promise, however, potential closure must be a factor for President Trump to consider. It is doubtful that the president would have to close the border for long in order for this action to have the desired effect. The president could close the border "in part" by limiting the number of lanes that are available through the ports of entry on the U.S.-Mexico border. He would have strong grounds for doing so. As CNN has reported: "The Department of Homeland Security is moving officers from its ports to help with the mission between ports, which will result in slow downs, a senior Department of Homeland Security official told reporters." Reducing lanes, which would slow the number of vehicles and pedestrians at the ports along the U.S.-Mexico border, would be a logical response to this reduction in CBP manpower. Such reductions would result in greater delays at the ports of entry. The longer the delays in moving produce from Mexico to the United States, in particular, the greater the likelihood of spoilage, and concomitantly, costs to the Mexican economy. Actions have consequences, and Mexico should be expected to bear the consequences of its inaction as relates to the illegal movement of migrants through that country, particularly as DHS must face the ramifications of that inaction. Once aliens are referred to removal proceedings, cases may take months or years to adjudicate due to backlogs in the immigration-court system. Of the [then-] total backlog [in the immigration courts] of 791,821 removal cases, 26 percent (203,569) originated with a credible-fear referral. Of that number, 136,554 involved ... nationals [of El Salvador, Guatemala, and Honduras]. Only 10,736 involved Mexican nationals. In FY 2018, of the 34,158 immigration-court completions that originated with a credible-fear referral, 24,361 (71 percent) were orders of removal. Of that number, 10,534 were in absentia orders of removal, meaning that the alien failed to appear. Therefore, in 31 percent of all initial completions in immigration court in FY 2018 that originated from credible-fear referrals, the alien failed to appear. Only 1,981 asylum applications were actually filed in those 10,534 in-absentia cases. This means that 8,553 aliens who were referred after credible fear proceedings to the immigration court to apply for asylum did not apply for asylum, and did not show up in court. Alien respondents who are under final orders of removal have received due process in the United States, and are amenable to removal. Those aliens whose cases were referred after a positive credible-fear finding who failed to appear for their immigration proceedings, and especially those who failed to appear and failed to even file asylum applications, have abused our humanitarian generosity and should be removed as quickly as possible. This will make it clear to nationals of the countries to which those aliens are removed that the United States is serious about enforcing its laws, and that illegal entry has real-world ramifications. These are just a few of the actions that the president could take, assuming that Congress does not rise to its responsibilities to address the issues Secretary Nielsen has identified in her March 28, 2019, letter.